Concrete curbing is one of many popular choices for landscaping edging in Calgary. 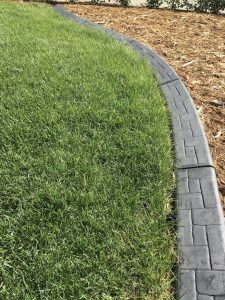 Defining borders is one of the most important aspects in creating a great looking landscape, and concrete curbing definitely gives your landscape a boldly defined border. Concrete curbing is available in many styles and colors. You can choose to have the curbing installed with no design or with a stamped design. Concrete curbing is a great option if you want a low maintenance edge around your garden beds, tree wells or hedges. You can choose to mow against the curbing by having your mower wheels rest against the edge or ride up on the edge. Minimal trimming is required around concrete curbing. Concrete curbing creates a bolder edge that mowing pavers or vinyl edging so it is well suited to both small and large garden beds. Concrete curbing costs less than raised garden walls or mowing pavers so it is a good choice if you are on a budget. The only drawback to concrete curbing is that, like all concrete products in Calgary, it can crack. Cracking is usually minimal but the risk is still there. In order to maintain the color of your concrete curbing and not have it fade, it is important to have the concrete curbing sealed every couple years. The clear sealer protects your curbing from UV rays and helps to maintain its color.